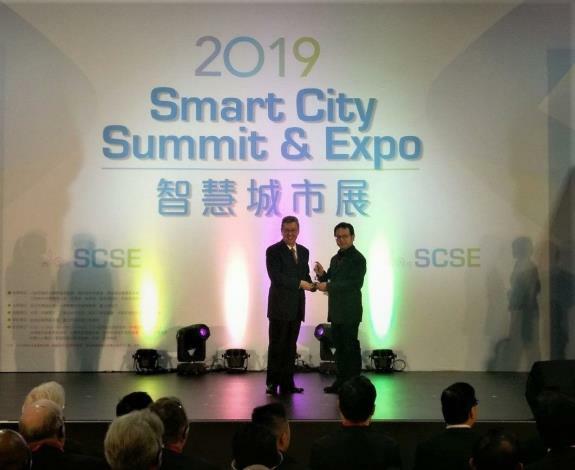 he "2019 Smart City Summit & Expo (SCSE)" held at Taipei Nangang Exhibition Center from 2019.03.26 to 2019.03.29 is aimed at accelerating smart city development with big data smart management focusing on introduction of AI in city government services. The Taipei City Road & Pipeline Information Center (RPIC) won the "Smart City Innovative Application Award" with its scientific and technology application of "road construction instant image management", "24-hour duct entities' joint and cross district stationing" and "underground duct's 3D image and information system" for road construction management by integrating smart platforms and mobile device APPs to monitor and control whole life cycle of road construction works. According to the New Construction Office, the Public Works Department, TCG the RPIC was established in July 2015 by joining 43 duct management entities in one place to integrate road construction scheduling and reduce repeated road excavation and pavement works with big data and system intellectualization. As a result, number of road excavation cases in 2018 down 34% over 2015, the year the center debuted, while the emergency repair and excavation ones fall even more to 48%. Thanks to the award by the SCSE the TCG is committed to advance the road construction smart management and ramp up comprehensive and precision public duct image and information system. Mr. Lin Yueh-hsun, head of RPIC, noted that the RPIC is scheduling and managing construction works with smart management system to control road construction information of current and next day (including road construction location, scope, unit and other instant information); take real time construction work photos and report (with mobile device APP) stop and inspection points throughout construction period; building up dangerous duct construction early warning over gas and high-voltage lines together with underground duct image and information database; having the construction units to verify image and information and inspect the site in advance to prevent damaging ducts in construction scope. To improve city government service quality the RPIC has linked the instant construction information and image of the entire Taipei City with "the Love Taipei" APP for residents' learning about neighboring construction information, remote monitoring construction status, and detour away from construction roads for easy and safe traffic. The Taipei City Government (TCG) has been demanding quality urban roads and continuing to advance its maintenance technology. In the "Urban road care and maintenance management and pedestrian environment barrier-free assessment" done by the Ministry of Interior, the TCG has been ranked the first among the six municipalities in terms of policy and practice for 5 consecutive years. In 2018, it won the special honor of being the only city "free from assessment," as well as being the national model. TCG is confident it will improve the quality of city roads even further based on several planned enhancements. Regarding poor road flatness after excavation and flushness with manhole covers, the Public Works Department (PWD) of the TCG has set up the Taipei City road and duct information center to tackle these issues with 9 innovative source management measures, including the duct unit's shared offices and immediate coordination, 24x7 duct issue handling and tracking, keeping track of construction process progress and quality using image monitoring throughout, providing citizens with instant information on construction status, reporting incidents with a smartphone app for instant handling and tracking, coordinating and aligning excavation works to minimize their damage to roads, promoting joint channels for cable sharing, getting duct coordinates to improve drawing information quality, and setting up 3D duct standard to build up Taipei City into a safe and high-quality city based on the 5 service targets of "focusing on safety,” "creating harmony ,” "improving quality,” "comprehensive drawing information,” and "data availability." It is also implementing new design concept to extend road service life and provide a better traffic environment according to road use characteristics, nonconventional asphalt concrete pavement materials, or more cost effective maintenance methods. The New Construction Office (NCO) test flatness of roads after construction based on the construction specifications by the PCC of the Executive Yuan. It mandates that the single point height difference between the new and old roads must be less than 6mm, and the standard deviation of ordinary roads must be less than or equal to 2.6mm, and the standard deviation of express roads must be less than or equal to 2.4mm when measured with 3m straight gauge and high and low flatness tester. In addition to post-construction inspection, the NCO is executing IRI surveys on road flatness to learn about road stretches with high indexes to collect data for statistics and analysis as well as improvement solution proposals to identify earlier signs of road faults and take preventative measures in advance. The IRI index assessment is undergoing a feasibility study for testing acceptance standards for a schedule for road surface milling renewal in the years to come, which will reduce repeated road surface repair and ensure road service life. The TCG is planning to transfer 8m or narrower roads' maintenance and management operation from the district office to the NCO of the PWD from 2016 on to implement Mayor Ke's "one-stop-shop specialty" policy once the 8m or wider roads' smoothing project ends. The NCO submitted the Neighborhood Road Traffic Environment Improvement program over 8m or narrower roads to enable citizens to better enjoy neighborhood roads with "Road update integration systemization,” "Road recovery and maintenance diversification" and "Patrolling, management, and inspection automation" in short, intermediate, and long-term stages. 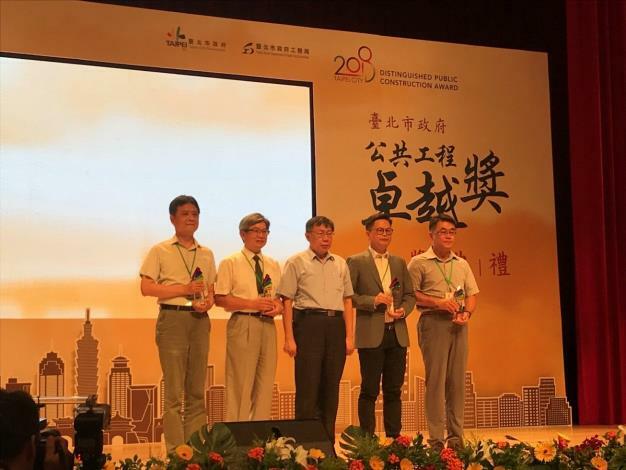 The New Construction Office, Public Works Department, Taipei City Government was entrusted to implement the “Refurbishment Project of Chenggong Market”, which won the 26th Chinese Architectural Golden Stone Award in 2018. It was ranked as an Excellent Public Construction/Excellent Work in the Spatial Activation Planning Category, being a masterpiece of H.P. Chueh Architects and Planners. H. P. Chueh, the architect, expressed that after observing the urban texture of Chenggong Market and analyzing the spatial needs carefully, the market’s space and open space of the city was regarded as the main body of design. To cope with the needs of moving the market underground, vertical logistic issues arose. Tactfully, the architect allowed the market and open space to be used in different manners. With architectural design, he achieved a balance and complex relationship between them. Architect Chueh regarded the “tectonic landscape of the market architecture” as the theme for the refurbishment construction of the market. Extending the market space and open land space of the market and fragmenting the architectural space volume on the ground, the architect connected the landscape's vegetation/light/activities and more to minimize the visual feeling of moving it underground. However, he still retained the continuous open space to provide recreation to citizens, constituting the mutual beneficial and complimentary spatial usage. Contextualizing the market routes and urban relationships, he demonstrated and clarified the ground activities. At the same time, it also suggested the entrance/exit of the underground space. At the outer rims of the fixed points, he left the leisure streets and bike parking zones required in the urban space to encourage citizens to use green carriers or walk to the market to promote the quality of living space. At present, the current address of Chenggong Market is land for road use in the urban plan. Street vendors began to gather there temporarily upon arrangement in 1986. Now, there are 196 stalls, occupying about 1,980m2. To comply with the goal of urban planning, improve the market economy, and provide people in the neighborhood with a quality living environment, Taipei City Government began to refurbish the market with careful planning in 2006. After years of communication, finally they came to a consensus. 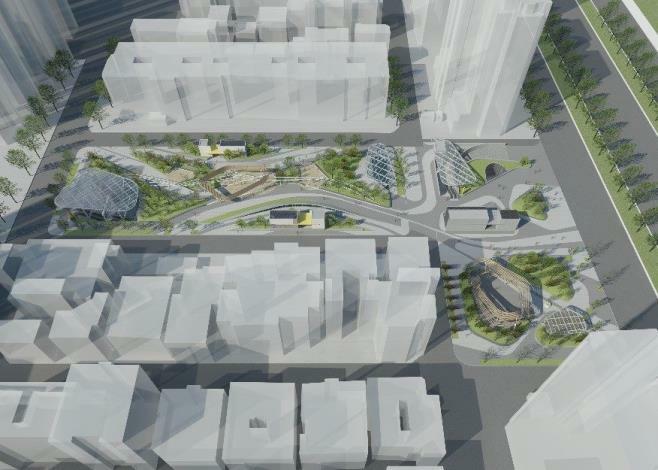 The semi-underground market was planned, and the square at the ground level is opened for the use of residents in the neighborhood to uphold the rights of the residential buildings on both sides. The three projects that the New Construction Office of the Public Works Department were responsible for, “The Improvement of the Surrounding Road of Beimen, Zhongxiao West Road, Zhongzheng District,” “Linkou Public Housing 2017 and the New Construction of the Athletes’ Village for the Universiade – Tender 1,” and “2017 Taipei Universiade Stadium Refurbishment Project – Taipei Municipal Stadium (including warm-up field) and University of Taipei (Tianmu) Shih-Hsin Hall”, won the honor of “2018 Taipei City Distinguished Public Construction Award.” “The Improvement of the Surrounding Road of Beimen, Zhongxiao West Road, Zhongzheng District” was an improvement of the surface road at Zhongxiao West Road (Huanhe North and South Road-Zhongshan North and South Road) after the removal of the Zhongxiao Bridge. It regulated the interlocking and complicated vehicle routes to make them straight and smooth. Lessening traffic conflicts, it promotes driving safety to construct a friendly city center on the basis of a human-oriented public environment and expands the Beimen Square and pedestrian space. By doing so, the pedestrians’ routes will become straight and convenient, connecting them to historical monuments and MRT stations. It enhances the comfort and safety of walking through the area. 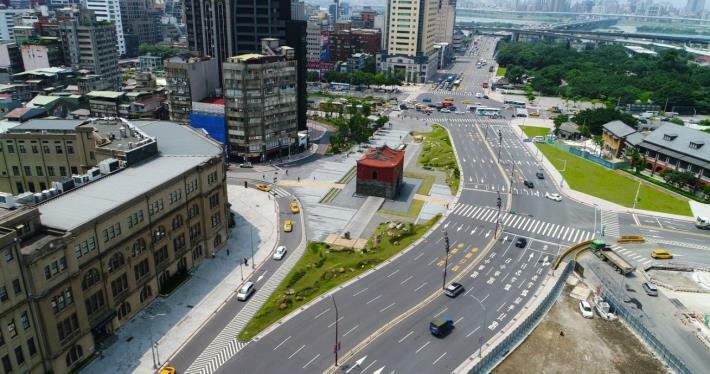 With the renewal the broadening of the sidewalks and improvement of the complicated current conditions of the driving routes, it allows people to understand the Taipei City Government’s dedication to public construction. Making good neighbors, it narrows down the gap between the government and the people. The “Linkou Public Housing 2017 and the New Construction of the Athletes’ Village for the Universiade – Tender 1” was a turnkey project for the new construction of the athletes’ village. It was an important joint effort by the central government, New Taipei City and Taipei City. During the Universiade the athletes’ village was the center, and was where food, clothing, housing, transportation, education, and entertainment were provided to the delegates from different countries. It was the key to the success of this international event. On this occasion, Taiwan earned high acclaim in sponsoring this international competition and Taipei City won praises from the local and international athletes and media. After the games, the athletes’ village will be open for rental to families who do not own property in an effort to improve the housing problem in Taipei. The “2017 Taipei Universiade Stadiums Refurbishment Project – Taipei Municipal Stadium (including the warm-up field) and University of Taipei (Tianmu) Shih-Hsin Hall” was a venue for the opening ceremony, closing ceremony, track and field events, and diving in the Universiade. The interfaces were numerous, and the construction was complicated. Nevertheless, by joining forces with local and international experts, associations, designers, inspectors, manufacturers, and sponsors, and after repeated discussions, integrations, and scheduling, it was completed on time in a short construction window. It was certified as Grade 1 by the IAAF. In the end, the Universiade went off without a hitch. Copyright 2009 New Construction Office, Public Works Department, Taipei City Government 4F., South Wing, No.1, City Hall Rd., Xinyi District, Taipei City 11008, Taiwan (R.O.C.). For callers in Taipei City, please dial 1999 for the Citizen Hotline. .